Our newest display, the original Film Projector in Mercoal is now available for viewing. The projector is from the mid 1930s and was used in Mercoal, along with a second projector up until the 1950's when the theatre was closed down and moved to Robb to become the new recreation centre. The projector room and all of its contents were bricked up and as years passed, was eventually all but forgotten. When the building was demolished, the projector room was rediscovered. One projector was donated to Hinton and the other to the Galloway Station Museum. Most communities in the Coal Branch had a projector. When new movies came out, a single film would be sent to the Coal Branch. Each day of the week it would be at a new town, so if you really enjoyed a flick you could watch it in Mercoal on Wednesday, Cadomin on Thursday and Mountain Park on Friday. Be sure to check out next month's event Museum basement tours! Guests will get an opportunity to see the 2500+ artifacts not on display in the museum and learn their interesting histories. The staff of the Galloway Station Museum had a fantastic time at KidFest! Thanks for everyone who came out on the cold Saturday to see all the great exhibitors and to have a sneak peak at some of the activities will be doing during Night at the Museum. 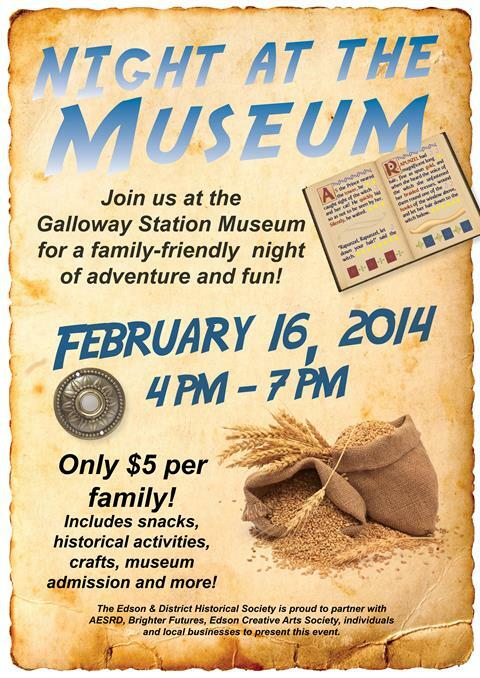 Be sure to check out the second annual Night at the Museum on February 1th. In parthnership with the Town of Edson's Unplugged Family Week events; the museum, Brighter Futures, Edson Creative Arts Society and some great local citizens have come together to create a wide variety of 'unplugged' activities for family members of all ages. Enjoy a Canadian favorite, snow taffy; take a pair of snowshoes for a spin, mill grain into flour, cook delicious jam, create a headdress, plus experience many other activities! One painting in the EDHS collection has been a mystery since its donation in 2005. A simple landscape with a tipple and train tracks portrayed the workings of an unknown coal mine. The painting is dated 1924 and is signed by a Tommy, although his last name is illegible. Without any further information on where the painting's location, we had little idea of its significance. A few months ago, a large donation of Mercoal Mine photos dated around 1935-1950. These pictures detailed almost every angle of the mine, including a South-West view which looked oddly familiar. After an Evansburg resident came to the museum with an increbibly interesting book- Ghost Towns of Alberta, the connection was made.The book highlights the Coal Branch, with a large section on Mercoal and its residents. One these happened to be a Mr. Tommy Tomoto, a Japanese immigrant who came to the Coal Branch in the early 20s. Tommy was said to be the best painter in town. Lining up the photo from 1937 of the Mercoal Mine to the 1924 painting of the mysterious tipple, you can see the same buildings, creek, bridge and train tracks. The not so legible signature clearly becomes Tommy Tomoto's. Local artist Sonja Boyce has brought in a fabulous collection of little landscape paintings that are framed and matted with archival quality products.They are available for purchase in the gift shop for $45.